In December, House and Senate negotiators reached a final deal on President Bush's education package. 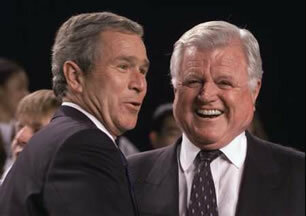 Ted Kennedy is smiling but conservatives are grumbling. The education package, while generously increasing federal spending, does not create nor foster voucher programs. This is a real shame. A "voucher" is essentially a government scholarship given directly to a poor family to be used at a private school of their choice. The idea is to get kids out of failing schools by creating a competitive education market in high poverty areas. Liberals don't like vouchers for many reasons. Religious schools would benefit from vouchers, teachers unions feel threatened, bad schools might be shut down, and the inner-city status quo would be shaken. Constitutional concerns and party-politics generally dominate the debate over vouchers. The fact that voucher programs actually exist is largely ignored. Let me make this clear: Voucher programs do exist! One such program was implemented in Milwaukee in 1990, and it has been expanding ever since. The Milwaukee Parental Choice Program (MPCP) offers families whose income is at or below 1.75 times the federal poverty level a "voucher," or scholarship, to attend a private or religious school of choice. Students are selected by lottery since the vouchers are popular but limited to 15 per cent of the district's public school enrollment. In the 1999-2000 academic year, more than 8,000 students received vouchers (or scholarships) of up to $5,000 each to attend 91 private or religious schools of choice. These 91 schools must meet basic guidelines to be part of the program. There have been two major studies of the effectiveness of the school choice program in Milwaukee. The plan was originally studied by a team of researchers headed by John Witte, a political scientist at the University of Wisconsin at Madison. Between 1991 and 1995, the researchers reported on the effectiveness of the program. They concluded, in five annual reports, that the choice initiative did not improve student performance. These early studies, however, were fundamentally flawed in methodology. The studies compared students in the school choice program to a much less disadvantaged cross-section of public school students. Comparing students of different socioeconomic backgrounds, the researchers could not properly evaluate the relative success of the program. In 1995, a secondary analysis of the original data compared students in the choice program to those who had applied for vouchers but were randomly rejected in the lottery. In other words, the new study compared students in the program to students of similar socioeconomic background. Here are the facts: The reading scores of students in their third and fourth years in the Milwaukee choice program were, on average, three to five percentile points higher, and math scores were five to 12 percentile points higher, than those of students who were unable to get a voucher. The researchers concluded, "If similar success could be achieved for all minority students nationwide, it could close the gap separating white and minority test scores by somewhere between one-third and more than one-half." Incidentally, Professor Witte, who headed the initial research, has recently published a book entitled The Market Approach to Education: An Analysis of America's First Voucher Program which argues that school choice does in fact help low-income families. The Milwaukee voucher system is most popular among African American and Latino parents (74 and 79 per cent approval respectively). Among all parents with incomes less than $11,000 per year, 81 percent support the current school choice program. The African American woman who founded the system, State Representative Annette "Polly" Williams (D-Milwaukee), was once, herself, a welfare recipient. On December 11, 2000, the Sixth Circuit Court of Appeals declared a similar voucher program in Cleveland unconstitutional on the grounds that it violates the "establishment clause" of the First Amendment. The Court apparently believes that "freedom of religion" entails the coercion of 4,000 underprivileged children to attend failing, state-run schools against their parents wishes. The US Supreme Court will review that decision this summer. Free choice creates a market, a market brings competition, and competition eliminates failure and rewards success. This is a fundamental principle of economics, and we are discovering that it holds true in education as well. President Bush and his new friend Ted should take a closer look at Milwaukee before signing any more education bills. This is Chris Coval's first contribution to Enter Stage Right.